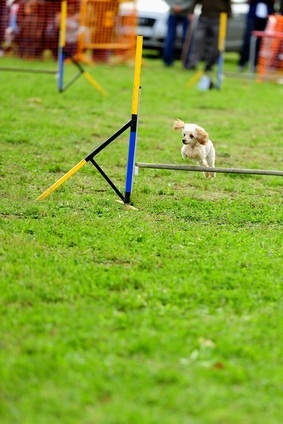 Dog agility events are good if your poodle gets bored easily and likes different forms of exercise. Your poodle should be between 1 and 1 1/2 years of age to compete. You can start dog agility training earlier. Agility events require a strong poodle with stamina. Dog agility equipment has dog obstacles that are set up, and your pet navigates through them. There can be seesaws, tunnels, poles for weaving in and out, bars or tires to jump over, planks to walk on, and a table where he has to sit or lie down. The United States Dog Agility Association, The United Kennel Club, the North American Dog Agility Council, and the American Kennel Club offer agility competitions. Read the rules for each agility event as they vary. There are 3 levels of competition. Senior dogs can compete in a preferred class of the AKC with lower jumps and more time to compete. Hunt trials appeal to the poodle's hunt and retrieve instinct. He'll watch where a bird falls, go to that spot to retrieve it and carry it to someone. Only standard poodles can do this test. There are 3 levels - junior, senior and master hunter. Tracking tests use your dog's nose to smell and all 3 sizes of poodles can compete. He'll be on a track with turns. The track has different items your poodle has to find. Two judges will judge and both have to agree your dog passed the test, then he gets a title: Tracking Dog, Tracking Dog Excellent or Variable Surface Tracking. He's a Champion Tracker after earning all 3 titles. 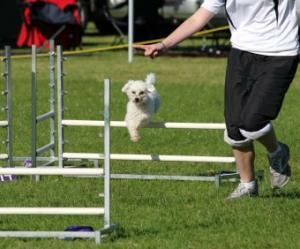 If your pooch is energetic and loves to learn new things, agility events may be what she could excel at. It will give your dog exercise and becomes a bonding experience for poodle and her owner.